Local and Toll Free International Call forwarding numbers are accessible to callers within a specific city or local area code or an entire country. For example, you can own a local phone number in Canada, Panama, Peru, etc., that will redirect your calls to your fixed landline or mobile phone number in any country. Why should I Get a 1800 Number with International Call Forwarding ? There are many reasons to get a 1800 call forwarding number. Reason #1. You have customers or associates or family in another country and you want to make it easy for them to reach you. For example, let's assume you have associates or family or customers in Argentina. You can sign up for a private Argentina phone number that, when dialed, will automatically call your phone number in the U.S. The per minute rate to call forward to the U.S. from a local number in Ireland is 6¢ per minute. 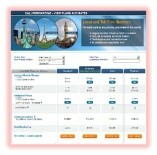 Choose from over 40 countries with local numbers available. Or, click here to view countries where you can get a 1800 number with international call forwarding capability. Reason #2. You want to create a local presence in a country. For example, you are a distributor of a product and you are located in the U.S. You want to make it easy to receive inquiries and orders from other countries. Now you can acquire a local phone number in Paris, London, Milan, etc. Or you can get a 1800 number that is accessible from anywhere in France, Italy or the UK and 40 other countries. Reason #3. You are going overseas on assignment and you want to make it easy for your callers to contact you. So you would get a Global Call Forwarding in your home country. Reason #4. You have a kid in college and you want to provide a dedicated phone number for her/him to call home. Get them a local call forwarding number in the city of their new residence and have the calls forwarded directly back to you. No PIN number, no taxes. Reason #5. You call only one international phone number and want a very low rate and an easy method to connect to that number. Remember, you can change your call forwarding number online, in real time. Change it as many times per day as you desire. Reason #6. You are traveling to another country. So you would get a CallMyGlobalNumber 'in' that country (hopefully a local number). Then you can dial that local 'in-country' number to make calls back home easily and cheaply. For example, you are going to Mexico City. Sign up for a Mexico local number and create your own international call gateway from Mexico City back to the U.S.
Reason #7. You want to forward your mobile phone calls to a number outside your country. With our service, you'll be able to program your mobile phone to call forward to your assigned CallMe 800 toll free number which will then forward your calls to any country. Can I Get a 1800 Number ? Most importantly, the network quality is the clearest available even when forwarding your calls overseas. And a very convenient feature is your ability to change the 'ring to' number in real time via the Web. Should I Get a 1800 Number ? You want to make it easy for friends, family or customers to reach you in any country. With our selection of toll free numbers and worldwide local numbers, chances are we can provide a 1800 number or a local international call forwarding number to satisfy your requirements. You have an existing toll free number now but are tired of asking AT&T, MCI, Sprint or some other company if 'international' call forwarding is possible only to hear it is not. You want to transfer your existing 1800 number to us. Your kids are off to college and you want to make it easy for them to call home so you get them a toll free number that calls you on your cell or home phone. You want a toll free number to 'ring-to' your international cell phone or landline. Choose from over 108 countries. Select from toll free and local numbers. 1800 service is billed to a credit card monthly. It's a month-to-month service, no long term commitment is required. There are no added taxes. Some toll free numbers in certain countries have a 'one time' set up fee and monthly fee. Other countries may have no set up fee but only a monthly fee. In addition to a possible set up fee and a monthly fee, there is a per minute rate applied to forwarded calls.